A Belarusian potato pancake which can be spiced and eaten anytime with an array of accompaniments. Peel and grate potatoes and onions on a fine grater. Strain potatoes and onions to remove excess liquid. Add flour and salt and mix it all together with spices you prefer. Shape into flat pancakes with your hands to be shallow fried. Preheat a frying pan and add vegetable oil. Lay out pan cakes and fry on both sides until they become golden brown. 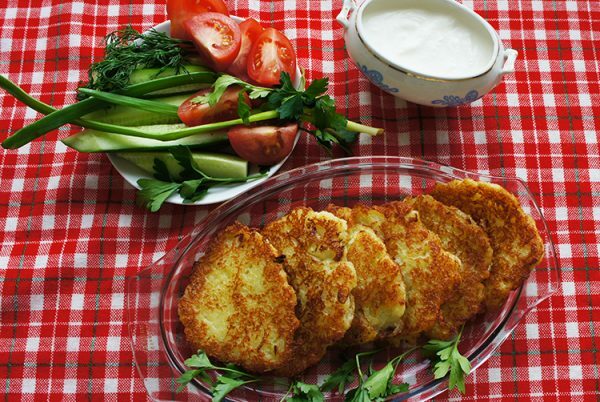 Serve with sour cream or preferred sauce and salad of your choice.